One year on, no justice yet. 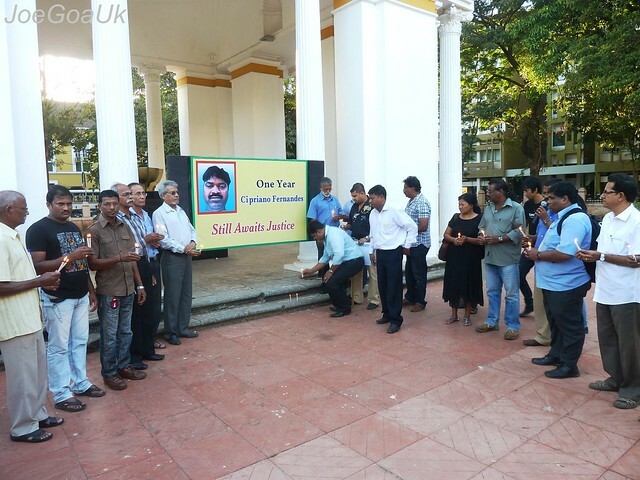 Today's meet at Azad Maidan to mark his first death Anniversary and to protest againt the police inaction in this matter. 7th November, 2012 [Wednesday] at 3.15 P.M. The Order passed by Hon’ble Court authorizing the Forensic Department of the GMC to dispose off the body if the same is not taken possession by the kit and kin of late Cipriano Fernandes. 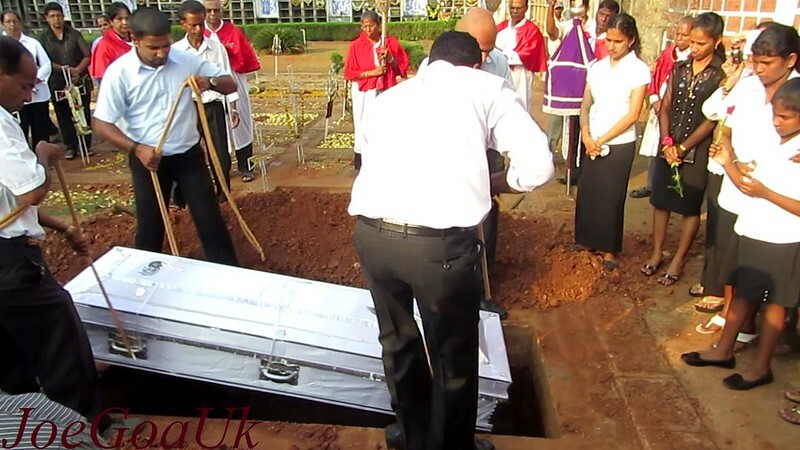 Hence, the decision (Conducting Funeral) has been arrived at UNDER PROTEST understanding that the ongoing investigation into the custodial death shall continue until the police personnel who have been indicted in the murder while in custody shall be punished appropriately in accordance with the law of the land. 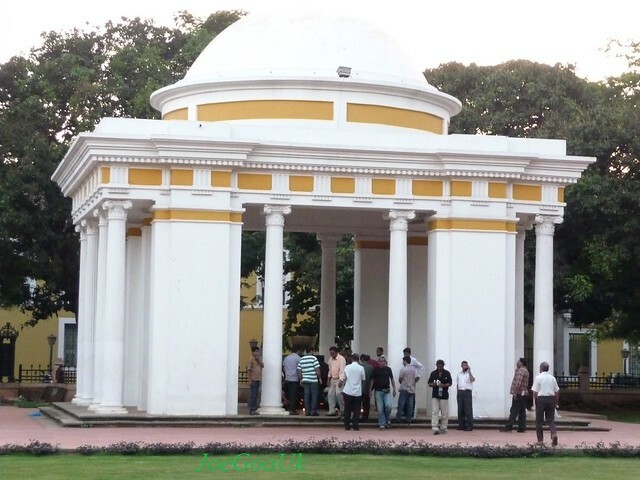 banyan Report DNA blood on banyan Report DNA blood on banyan Report - Negative 31/12/15 DNA blood on banyan Report - Negative 31/12/15 “The red marks were not blood stains on the vest”, said SP KashyapDNA blood on banyan Report - Negative 31/12/15 “The red marks were not blood stains on the vest”, said SP Kashyap More than 5 years now, no justice yet. There were moves by the police to close the case..
JMFC / Court issued bailable arrest warrant against Gerogina Nunes one of the witnesses in the Cipriano Fernandes murder case for being absent in the court on 14/2/11 for hearing inspite of summons issued to her. Says Cipriani 'willingly' sat in the Police jeep without a struggle..
SDM Shetye who conducted the enquiry into custodial death has concluded no guideline followed by the police and that CIRIANO WAS NOT SERVED DINNER AND WAS MADE TO SLEEP ON THE FLOOR WITHOUT MATTRESS OR BEDSHEET. Around 11.30am on 8th Ja. 2011, Ciriano who was snorring on the fllor, suddenly woke up and while trying to get up, collapsed in the officers' section room. He was immediately rushed to GMC in an 108 ambulance. As froth was oozing out of his mouth, he as sent for a CT scan. Georgina was absent again in the court yesterday, she is hospitaised for low pressured. 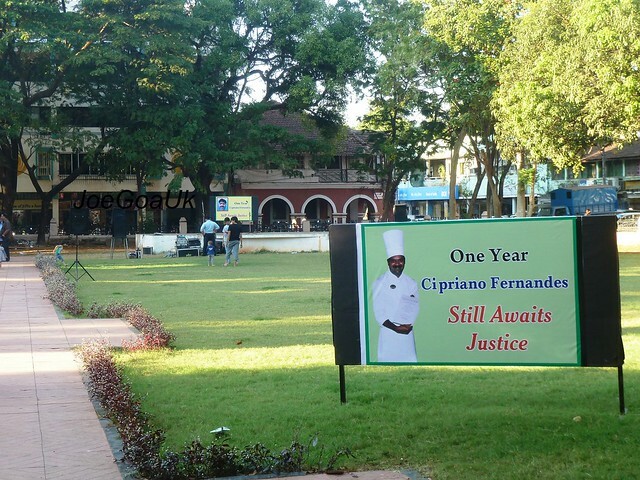 Georgina Nunes, the girlfriend of Cipriano Fernandes who allegedly died in police custody, on Wednesday, told the Court that Panjim police tried to pressurise her to change her statement before the Sub-Divisional Magistrate (SDM), who conducted inquiry into the unfortunate incident. 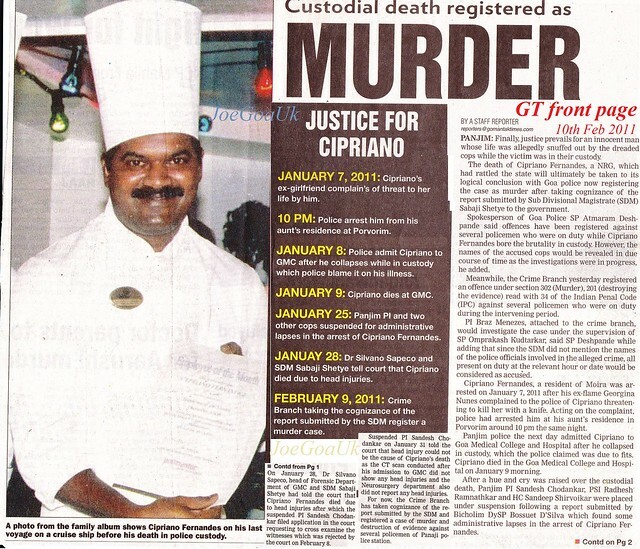 In her deposition before the Judicial Magistrate First Class (JMFC) Panjim, which is conducting trial into Cipriano’s death, Georgina claimed that Cipriano died as a result of police beating. “After the SDM recorded my statement, police constable Sandip Shirvaikar came to my residence at Caranzalem and asked me to change my statement as I deposed against him for beating Cipriano in the police van and police station,” she told the Magistrate in her two-hour-long deposition. “Cipriano’s death was unnatural. I feel the police have taken his life by hitting him on his head,” she added when the Magistrate asked her opinion on the death. Georgina deposed after the JMFC issued bailable warrant against her for failing to respond to summons earlier. Deposing further she told the JMFC that Cipriano was beaten inside the vehicle right from the time he was picked up from Porvorim till the Panjim police station. She further stated that two constables, one of whom was Shirvaikar dragged the unconscious Cipriano holding his collar inside the police station and dumped him in a room adjacent to inspector Sandesh Chodankar’s cabin. Earlier, Georgina had given this statement made before the JMFC today to the SDM and the State Police Complaints Authority. She said that when the vehicle reached the KTC bus stand in Panaji, a head-constable started pulling at the hair of Cypriano, who was crying out in pain. She also informed that Ryan, who was driving warned her not to turn around and look at what was happening behind her, as she was seated besides the driver (Ryan) in the front of the jeep and Cypriano was seated behind her along with the police. She deposed that Cypriano could not take the beating any more and even tried to reach the brakes from the back of the vehicle so as to halt it; however, Ryan kept pushing his led back. She said that although Cypriano stopped making noise, she could hear commotion in the back of the vehicle. She said upon reaching the Panaji town police station, Ryan along with other constables pulled Cypriano from the jeep and she notices that Cypriano’s mouth was closed and that he was unconscious. 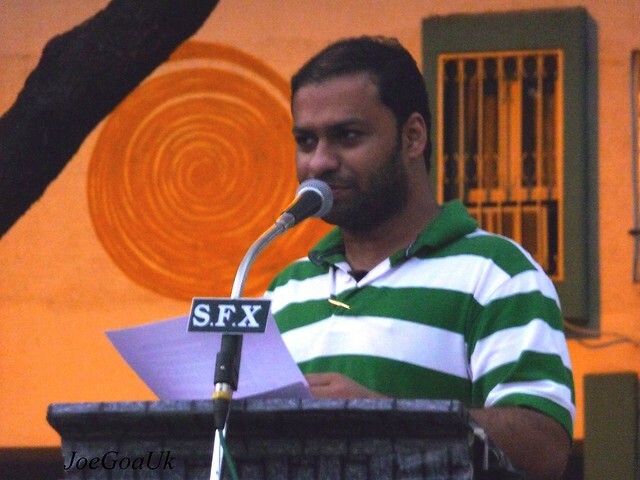 "Then they dragged him to the room next to the police inspector, Mr Sandesh Chodankar’s cabin." She said she did not know how Cypriano became unconscious. She then deposed that that Cypriano was beaten by some 6 to 7 policemen, some of whom were in civilian clothes, and that the beating went on for about 10 minutes. She said, "I could hear the sound of the assault but I could not see him as they had encircled him." She could also not ascertain if Cypriano was conscious during the beating. She further deposed that on January 8, she was called to the police station at around 5 p.m. and told to be seated on her scooter as head constable, Sandeep Shirvoikar wanted to talk to her. She deposed that on questioning Shirvoikar, as to where Cypriano was, she was told that he was drunk and had suffered an attack of fits and was admitted in the GMC at Bambolim and that he was discharged. When she asked who released him, Shirvoikar said that Cypriano himself had signed the bond papers. She said that on Januray 9, Shirvoikar called her many times; however, she did not take his calls. Later she called him and was informed that Cypriano had expired at around 4 a.m. in the hospital. She said she was stunned and shocked to hear of Cypriano’s death, she was later called to the police station to record her statement. In her statement to the JMFC, she said that Cypriano had no health problems and even denied having knowledge about his going to the IPHB. She refused to endorse the view that Cypriano died of natural causes, but said that according to her "Cypriano died due to police assault on the head and added that there was record of his arrest by the police." 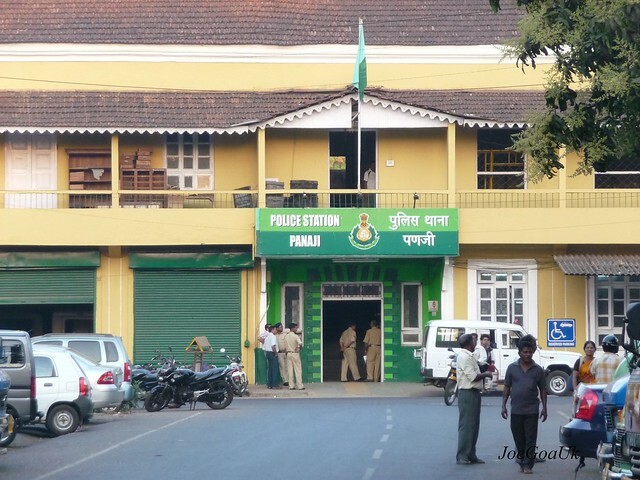 A murder in the Panjim Police Station? 8 cops asked to file reply by March 28. State Police Complaints Authority has asked them to reply to the notices issued by it in the custodial death case. 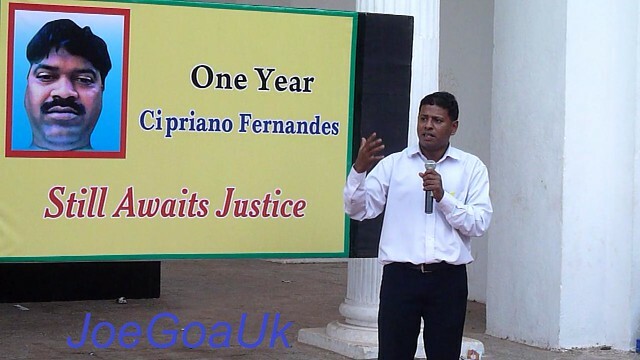 In a first of its kind decision in Goa pertaining to a police custodial death, the Goa bench of the Bombay High Court chaired by Justice A P Lavande and Justice U Bakhre has handed over the investigations of the Cipriano Fernandes death case to the Central Bureau of Investigations (CBI). 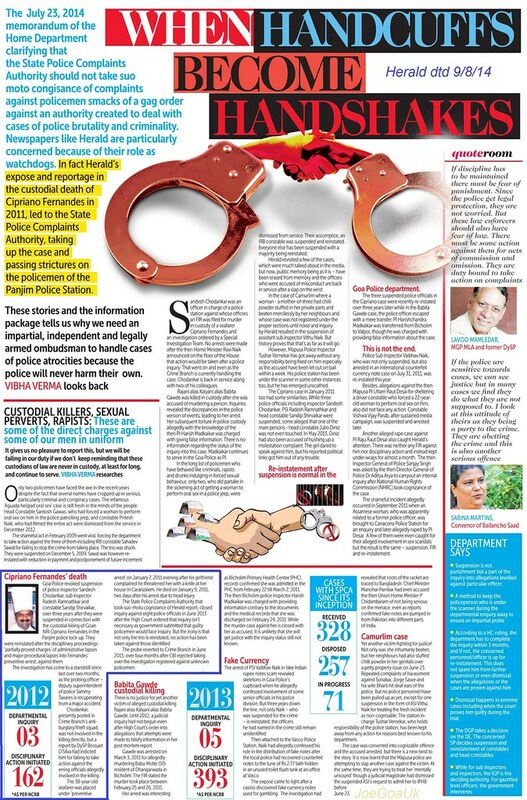 Last week the Chief Minister of Goa, Digambar Kamat cleared the case file to be handed over to CBI as the law department was of the opinion that since the allegations involved police officers and the investigations were being conducted by officers within the same police department; hence it needed an independent body to investigate the case to be impartial. 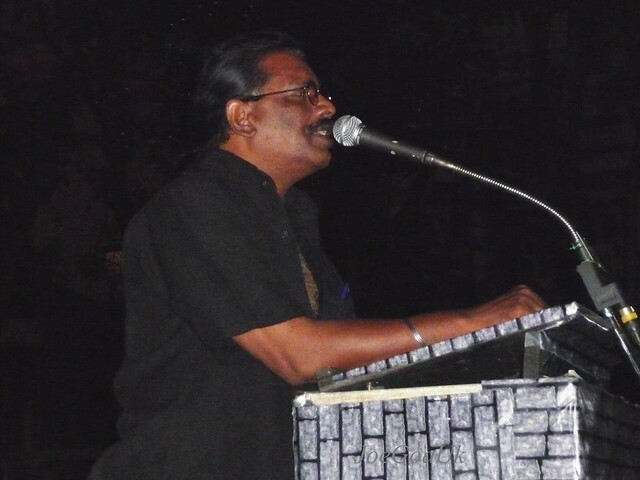 Human Rights activist Jowett D'Souza who had taken up case, expressed that he was happy that the court has appointed the CBI to investigate into the custodial death. It is a clear human right violation. 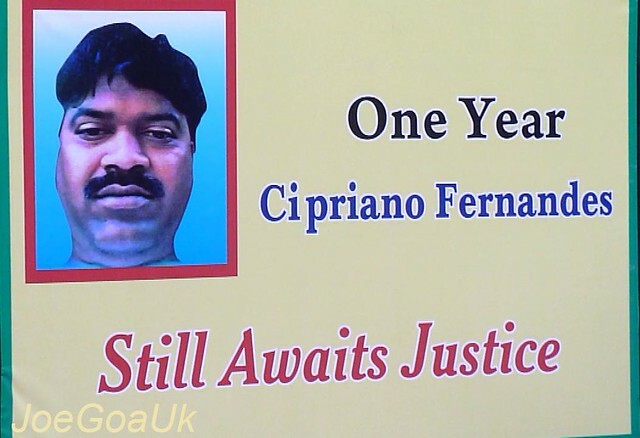 Cipriano Fernandes was allegedly killed in police custody. 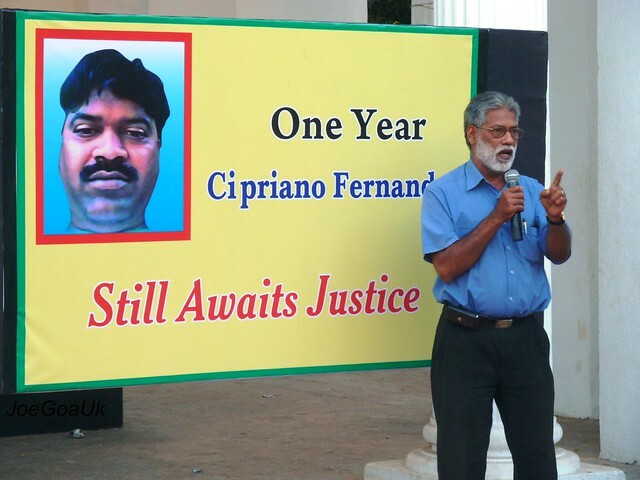 Now with CBI investigating the matter, people who have come out in support of Justice for Cipriano feel that it a move towards some justice. 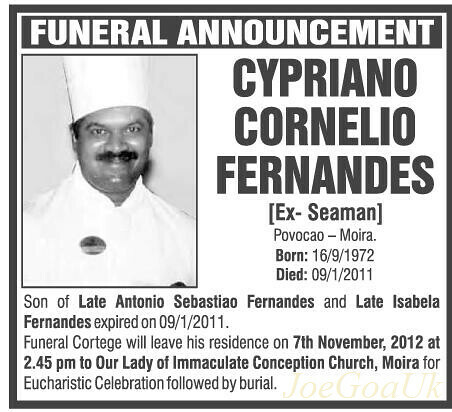 PANJIM: The Goa police paid 5 lakh to the next of kin of Cipriano Fernandes of Povocao, Moira, a victim of police custodial death more than a year ago. The interim relief was paid following directions from the national human rights commission. The amount has been paid to the paternal aunt of Fernandes. 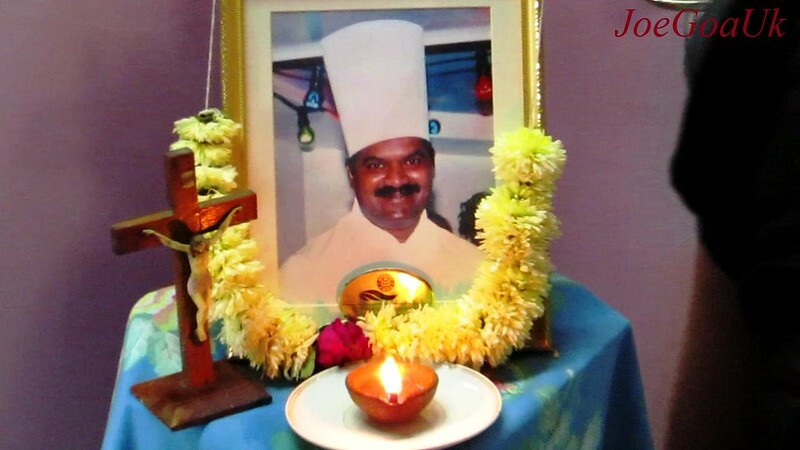 In view of the report submitted by the additional district magistrate indicating that there were seven injuries on Cipriano who died in police custody on January 9, 2011, a complaint was lodged against police personnel. 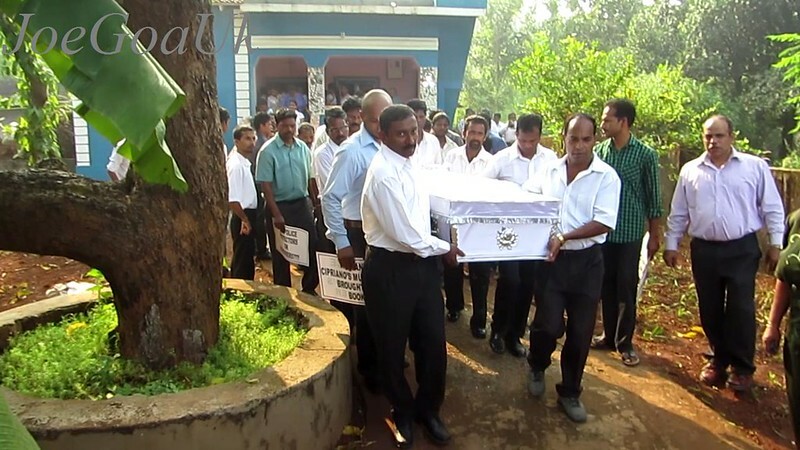 As the SDM had prima facie found that there were violations of deceased human rights on the part of Goa police officers, the Goa police department found no objection for award of interim relief to the next of kin. The national human rights commission appreciated the "quick action taken by the government officials in this matter" and recommended that the next of kin of the deceased may be paid 5 lakh. 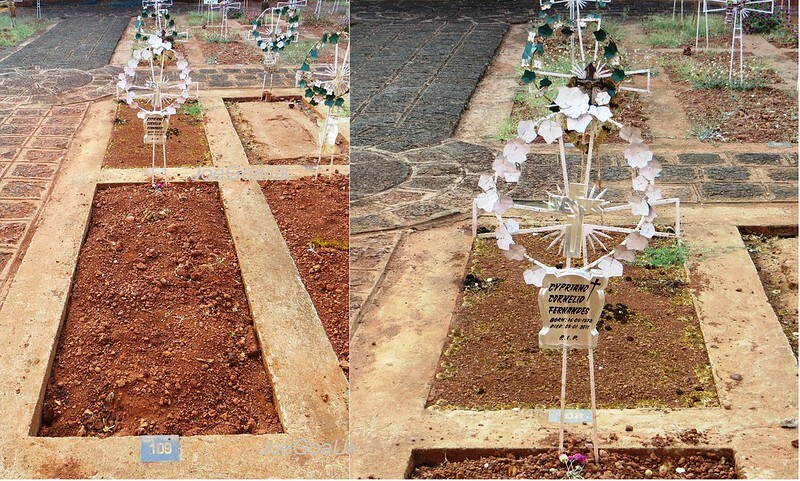 The question was who should be paid the interim relief as the parents of Cipriano had died. Considering various aspects, the commission recommended that the relief be given to Simpliciana, Fernandes' paternal aunt. 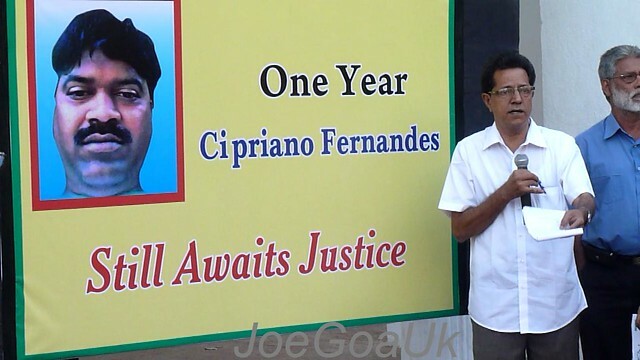 Will those constables who beat Cipriano to death be ever punished? All Police involved set free? ?